Who doesn't love long weekends, right? And what could be better if the Monday itself is also a holiday! That means no Monday blues for all of us. Hubby had some work on Saturday so as usual Babycakes and I stayed at home. Before the weekend, I planned to take her to one of the indoor gyms but I know it will be packed considering it is a weekend. I've taken her to JKids Playground at Tropicana City Mall twice so I thought I wanted to take her to other gym and somewhere nearer. There is one gym called Jungle Jungle at Plaza Damas. I read a review online and saw the pics and it looked more or less the same as JKids Playground. The only difference is the color scheme and the theme. The Jungle Jungle gym is more greenish with jungle-like decos and colors whereas JKids Playground is more like a candyland. As I read the review, I learned that the entrance fee on weekends and public holidays is a whopping RM50 per kid! I find it very expensive. Even Jkids Playground's RM30 fees for weekends is already considered expensive to me, what more RM50. That's it, scrap the idea. We shall do some other activities instead. I went on Pinterest and found so many great ideas for activities for toddlers and most of the activities are very cheap and they promote the exercise of fine motor skills. One of the ideas that intrigued me was painting with q-tips or cotton buds using home made paint. It is very easy to make and it requires the ingredients you probably already have in your kitchen. Of course you can buy the paint but make sure they are safe and non-toxic but if you make your own, it is much cheaper and even if your child swallows it (which they will try and lick some, you know how curious they are) you won't have to freak out because the stuffs you use are toxic-free. In fact, they are edible. Only thing is, they are salty. Flour- I used tepung gandum. So cheap! Salt- Who doesn't have salt in the kitchen, right? I've no idea the purpose of the salt but one thing I know is that it won't make the paint moldy when it's dried. Food colorings of your choice- I bought Star Brand orange and blue solely for this. I already have red. Too bad Cold Storage ran out of Star Brand green food coloring. They do have other brands but they're imported and more expensive. Another local brand is selling at RM7+ per bottle. Why would I need a RM7+ or Wilton's food coloring when I can get one at only RM2.99? Q-tips of cotton buds- Any brand will do. Go to Daiso and you can get a huge container of cotton buds for RM5. Cotton buds are perfect for little hands. Plus, I don't have any paint brushes. Recycled papers/boxes/card stocks and some newspapers and scissors to cut. A bib to protect your child's clothing. I set up a work station for Babycakes. I covered the desk with newspapers and tape the papers to the desk. I made the paint by mixing the ingredients and I poured them in an egg carton. 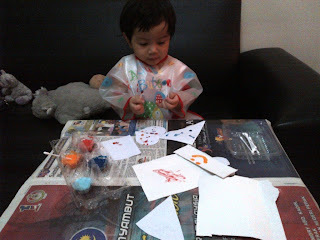 Cut boxes/card stocks etc into shapes and get your child to paint with the cotton buds. 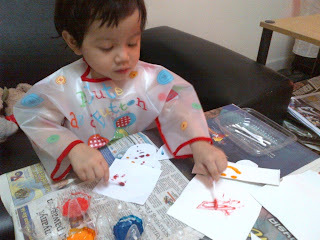 At first Babycakes was a bit hesitant to paint until I showed to her the how-tos. She was also a bit hesitant when the paint touches her fingers but I assured her that it's ok, we can wash our hands later. She had so much fun and she likes it when the paint drops onto the paper and made 'bubbles', according to her. I prefer to use cardboard or card stocks better because they are thicker and they don't fly easily and they don't get soft when wet with paint. You can cut up cereal or biscuit boxes for example. Babycakes really enjoyed the activity and we painted for more than an hour. It was well worth it. After she has painted, I let it out to dry.